Wish for Wins and Free Spins this May! Your winning wishes are our command this May simply for depositing as little as $25! 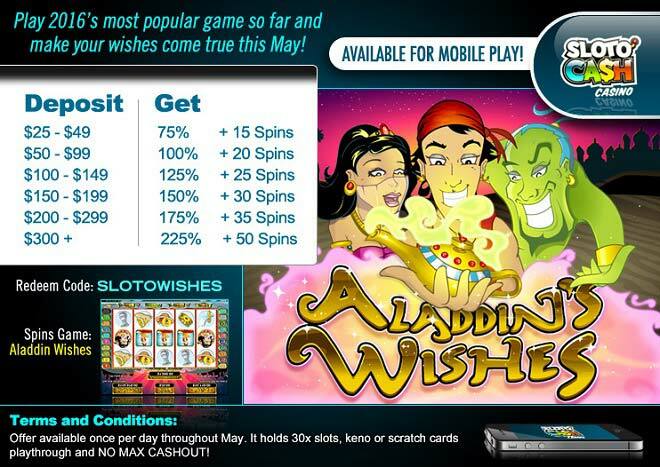 Spin the reels of our most popular slot Aladdin’s Wishes and add up to a 225% Match plus 50 Free Spins! Spin for wins this May when Aladdin himself makes an appearance on the second, third and fourth reels and fill in any combination as a wild symbol. Everyone’s favorite genie is joined by his Scatter Magic Lamp that triggers the fantastic bonus round game. Choose from a screen full of lamps, with the number of picks decided by the number of Scatters that triggered the round. Four lamps hide cash prizes based on the original wage and one very special lamp reveals 25 free spins, each with a 2x multiplier! Uncover the magic of genies and lamps this May when you deposit as little as $25 to play with up to a 225% Match and 50 Free Spins!